Health, safety and security are three main issues which determine if your cruise is a successful vacation. Health is a big issue because if one person gets sick, the entire ship can become infected. Gastrointestinal illness is the most common illness aboard cruise ships. The cause of the outbreaks is a common worldwide virus that is easily transmitted from person to person. Most of the public thinks this virus is caused from the ship's food and water supply. Wrong, it is caused by person to person. For example, a passenger could become sick by coming in contact with germs on a surface previously touched by someone else, and then go and eat some food with their hands, or touch their eyes, nose or mouth with their hands. Occasionally it becomes necessary to isolate infected individuals until they are no longer contagious. This is done to reduce the risk of other passengers and crew members getting the virus. Most cruise ships are allowed to disembark passengers if they refuse to remain isolated or who fail to report that they have the illness. Always wash your hands with soap and warm water regularly during the cruise, especially after using the restroom and before eating, drinking, or smoking. You should wash your hands while mentally singing Happy Birthday two times. According to the US Centers for Disease Control and Prevention, "hand washing is the single most important means of preventing the spread of infection." Use a paper towel to flush the toilet and to open the door to leave the public restrooms. Throw the towel away as you leave. 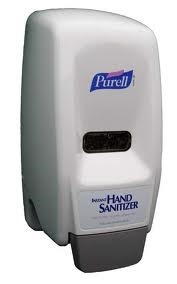 Throughout the ship you will see hand sanitizers. Use them! At meal time there is even a crew member standing by the sanitizers to be certain everyone uses it. For the first 48 hours at sea, you are served by crew members, wearing gloves, as you go through the buffet. This is to prevent many hands from getting around the food until passengers get into the habit of the sanitizers. 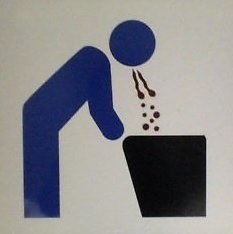 If you experience vomiting or diarrhea, you should contact the front office or the medical center immediately. Usually there is no charge for calling the medical center to discuss your illness. A charge to your room will be made for a visit to the center or if a doctor makes a visit to your room. The sooner you notify the front desk or the medical center the faster you will recover. If someone has become ill in a public area of the ship, contact the front desk immediately as it has to be cleaned and disinfected to prevent the spread of the virus. Some people get seasickness. The front desk will give you a seasickness pill, free of charge. Check with your doctor before you leave to see what he or she would recommend. Apply cool compresses to the burned areas. Taking a cool shower can help. 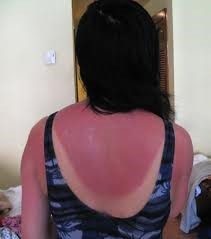 Sunburn dehydrates you so be certain to drink fluids. Water is best, liquor is the worst. If you experience pain, take aspirin or tylenol every 4 hours. Apply a moisturizing agent to your skin. Never use a product which is petroleum based. Safety aboard the ship is extremely important. This headline includes the ships safety briefing, fire, general safety reminders, mobility and sensory assistance. 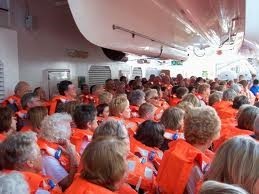 Approximately 30 minutes before the ship sails you will have a safety drill. This drill is mandatory by maritime law. This drill is a briefing at the lifeboat assigned to you. This assignment is usually located on the back of your entry door. It will familiarize you with safety precautions if the ship would have to evacuate at sea. Passengers will hear 7 short blasts followed by one long blast on the ship's whistle. If you see any fire or smoke dial 911. The ship has a fire alarm signal which is one short blast and one long blast repeated at least three times. 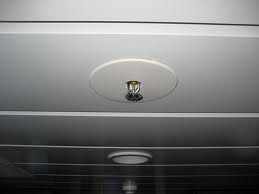 All staterooms have smoke detectors and sprinklers in them. If your stateroom is affected leave it! Evacuation routes are posted inside your stateroom. You should check the route out when you arrive on the ship. Just as you would do at home, if the fire is not in your room, feel the door before opening it. Never open the door if it is hot or you see smoke coming through the cracks of the door. Call 911 and tell the person who answers you need help. 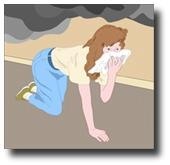 Put a wet towel under your door to help keep smoke out. You will be safely removed from your room by the ships fire and rescue team. If your door is cool, slightly open the door making sure no heat or smoke rush in. If there's no fire outside your door, leave immediately taking a wet cloth with you. Stay close to the floor. This is so you can see and avoid inhaling a-lot smoke. Keep your mouth and nose covered with the wet cloth. 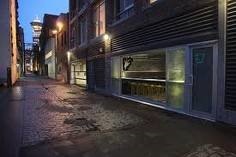 Follow the illuminated strip along the floor to safety in a public place or to your lifeboat assembly area. Listen to instructions by the ship's crew. Don't return to your room until you are given an all clear by a crew member. There are several other reminders which will help keep you safe on your cruise. Decks can be slippery. 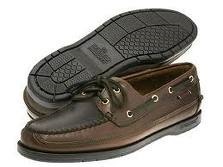 Always were a shoe with a rubber sole. Strong winds can make doors close suddenly. Keep your hands away from the frames on the doors. Be careful of the thresholds of some door frames. Supervise your children at all times. There is no supervision at the swimming pools or jacuzzis. Respect the fact that smoking is in designated areas only. When the seas are rough, be sure that you have secured moveable objects in your stateroom. Be careful of the high threshold at the entrance of your bathroom. Always keep one hand free for support. The is no supervision in the gym. Always use the bath rug when getting in or out of the shower or bathtub. Always put in the bath mat before taking a shower or a bath. Make certain it is secure. Always have your guest ID card with you when leaving or returning to the ship. If your guest ID card gets misplaced or you loose it, report it ASAP. Each stateroom has a safe in the closet. You can also use a complimentary safe deposit box available at the front office. Most ships are up to date on security in ports. There are, however, some precautions which should be taken. Use only transportation arranged by your ship. When taking a taxis be sure that the driver speaks English and understands your destination and you understand cost before entering the taxis. Avoid areas that are not frequented by visitors. Stay in well lighted areas. Avoid shortcuts through alleys, parks or vacant lots. Avoid political rallies and street demonstrations. Be aware of the people around you. Be suspicious of people who approach you. 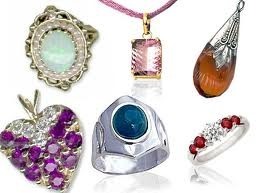 In confronted by a criminal, remember, money and valuables can be replaced. You can't be. If you are planning to buy drugs at a port, remember, passengers in possession of illegal drugs are subject to immediate disembarkation. 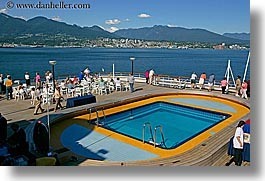 By observing what has been written in this article you will almost be guaranteed a healthy, safe and secure cruise. Bon Voyage!